Hey everyone! At the moment I'm watching a re-cap on the beautiful gowns from the MET Gala last night. Who else out there is hooked on it?! Any-who I have another amazing review for you guys. 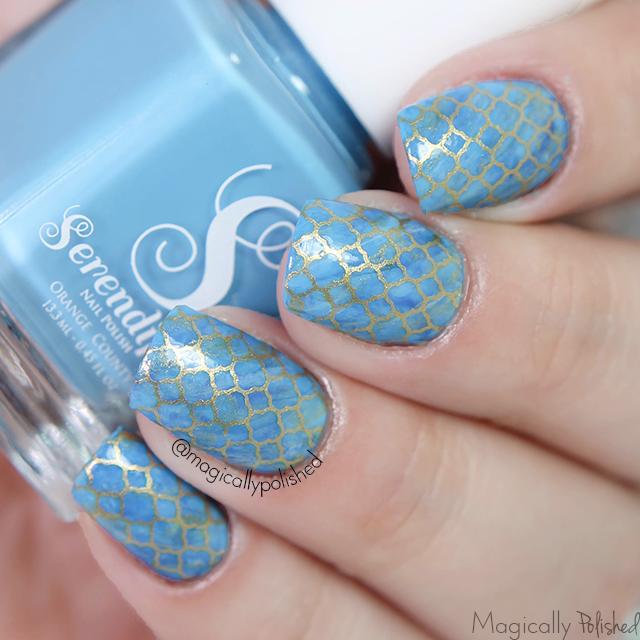 For today's post I have some swatches from a brand called Serendipity Nail Polish. Last time I reviewed their products I was extremely impressed, so I was very excited to try out their new collection. 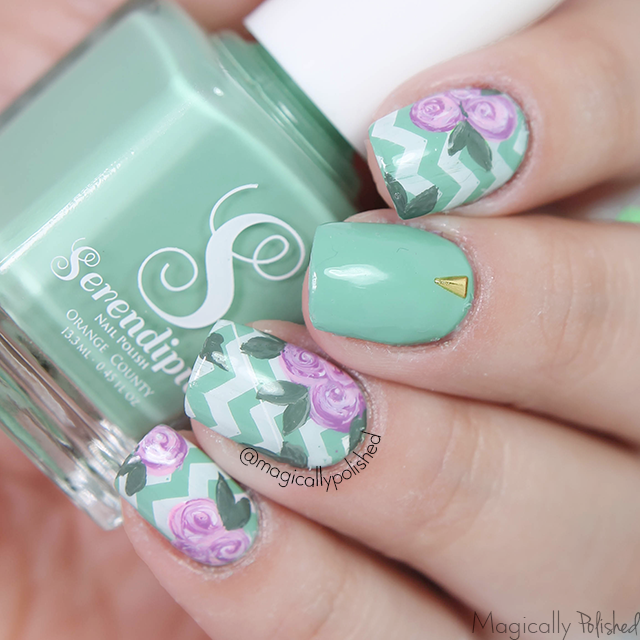 Mint Martini- is a really gorgeous mint green creme and one of my faves for the season. The formula on this polish was great, it has a really nice consistency and it flowed nicely onto the nail. I used two coats, sealed with sealed with Finishing Touch top coat. For this look I definitely thought about what defines spring, so to me, are florals! First I applied two coats of Mint Martini. 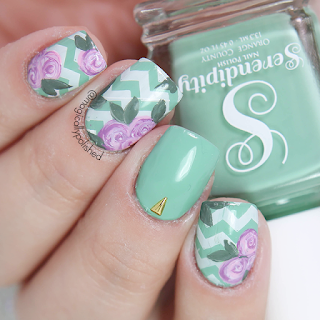 Once completely dried, I then stamped a chevron pattern using white stamping polish. 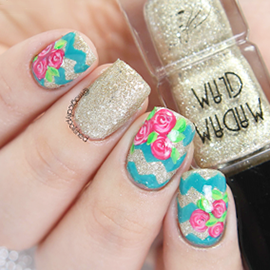 I then added a few florals using Summer Sunnies, Vacation Vibes and with sealed with Finishing Touch top coat. Summer Sunnies- is a gorgeous baby pink creme. The formula on this polish was absolutely perfect and applied smoothly onto the nails. You can definitely get away with one coat for full coverage. This is one coat sealed with Finishing Touch. For this look, I was inspired by a wallpaper pattern I saved on my Pinterest board. I just knew this was the perfect shade to create this design. It's so easy and simple to create. For the base I applied two coats of white nail polish. Once the base was dried I applied Summer Sunnies on the tip and tiny dots using a black polish and dotting tool. 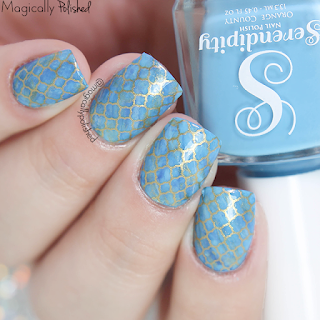 Vitamin Sea- a baby blue creme and one of my top favorite shades in the collection. Mostly because I LOVE blue shades. 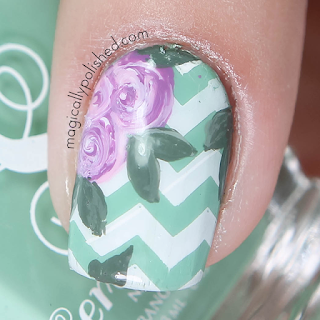 The formula on this polish was absolutely perfect and applied smoothly onto the nails. You can definitely get away with one coat for full coverage. This is one coat sealed with Finishing Touch. For this look I want to use different shades of blue, but most of all Vitamin Sea. Once the base was completely dried I then created a brush stroke looks using darker shades of blues and a bit of gold. 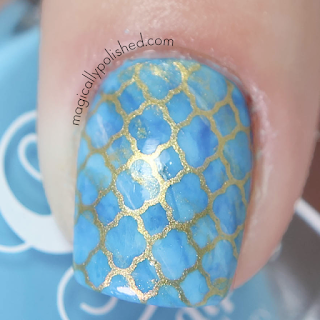 I then stamped a qua-trefoil design using my stamping plate using gold polish and sealed with Finishing Touch. Vacation Vibes- is medium purple creme and is perfect fit in the collection. The formula on this polish was absolutely perfect and applied smoothly onto the nails. You can definitely get away with one coat for full coverage. This is one coat sealed with Finishing Touch. Sunshine Rainbow- is a gorgeous gold and holo glitter polish. The application was fairly good, not to thick or thin to apply. This is a perfect topper when applied with one coat, however, alone I used a make-up sponge trick for full coverage sealed with Finishing Touch topcoat. Overall I am very impressed with S.N.P polishes and their unique shades for the spring/summer. Their formula requires minimal coats which makes the application easier and fast drying time, especially their top coat. 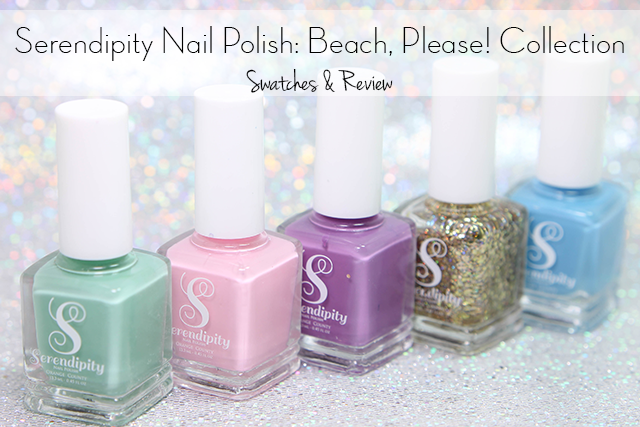 You can purchase the entire collection from Serendipity Nail Polish website for $45.00 (*Plus one free bottle of Finishing Touch, promo code is: TOPCOAT) separately for $10.00. Connect with Bundle Monster: Website | Facebook | Twitter | Instagram | Tumblr | Pinterest Hope all of you enjoyed my post today! What do you guys think? Let me know in the comments below!